Is this a new celeb trend for summer? Emma Watson, Amber Heard and JWWow are just a few of the celebs who are dip-dying doogie hair all the colors of the rainbow! Did model turned actress Amber Heard kick off this trend? She was the first one spotted with a tie-dyed Yorkie. Poor little Pistol. We know Emma’s a leader, not a follower…yet she couldn’t resist making her dog pink! At least her scarf kinda sorta matches the dog. New mom, Alessandra Ambrosio had her dog Ruffles pink and purple! Not content to have one dip-dyed dog, Celebrity Apprentice Aubrey O’Day has two: One pink and one blue! Poor poochie! Color her dog embarrassed! 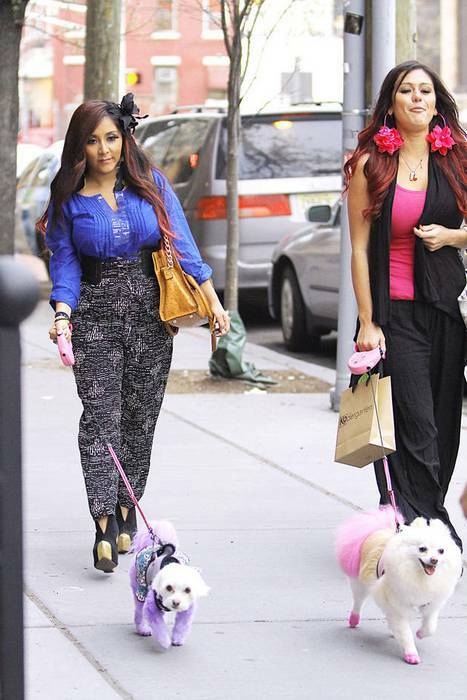 Here's Snooki (pregnant in heels) and her pal JWoww terrorizing the streets of Jersey City with their lavender and pink dogs. Wherever there’s a trend, there’s Courtney Stodden trying to cash in on it. I don’t know what’s worse—the fact that the dog has pink hair, or the that the poor thing is mostly bald.